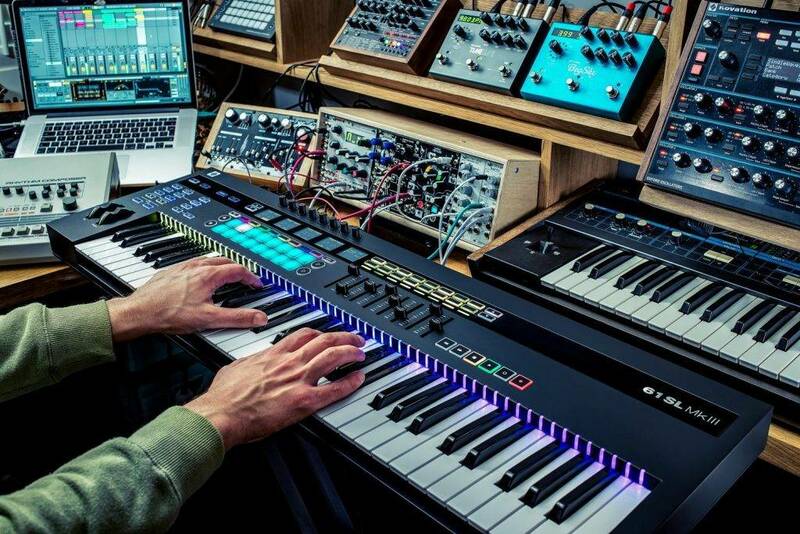 Novation Announce NEW SL MKIII 49 & 61 Controller Keyboards! MIDI and CV-equipped keyboard controller with an eight-track sequencer! Novation today announces the next generation of SL keyboard controllers. SL MkIII is far from your typical keyboard controller. It’s an all sequencing, all dancing hub for all of your music-making tools. A centerpiece to connect, control and create with your entire setup. Computer or not. Create quickly and easily with your MIDI hardware and CV/Gate synths. Build your tracks in the eight-track polyphonic sequencer: everything in time; everything in key; every control at your fingertips. Novation worked with Ableton to create an unprecedented integration with Live. SL MkIII truly pulls your sessions out of the box. The full-colour LCD screens give you full visibility of your parameters, while the pads, buttons, eight faders and eight knobs get you hands-on with your music – and in any major music software, using InControl. Deep integrations with Logic and Reason – plus HUI compatibility with Cubase, Pro Tools and Reason – mean SL MkIII can follow you away from Ableton, too. SL MkIII is the centerpiece that can be used to control your whole studio, working perfectly alongside your DAW. Make working with your hardware easy and creatively rewarding, and construct your next production in the 8 track polyphonic sequencer, with everything staying in sync. Whether you’re in the box or outside the box, the MIDI and analogue clock and transport controls keep everything running in time. Previous Introducing Roland’s NEW LX700 Digital Piano Series! Next NEW! AKAI MPK Mini Play Just Announced!